This has been in my "to blog" folder for awhile, but better late than never, I suppose. In the fall, my library was able to reopen for Sundays for the first time in like five years. This is great news for patrons, but since our seasonal Sunday hours are voluntary (with paid overtime), we sometimes have a shortage of staff willing to work them. In my library, there needs to be a Department Head in the building at all times. Generally this isn't a problem, but if no Department Head volunteered to work a particular Sunday, other staff (with library degrees) can be acting Department Head. 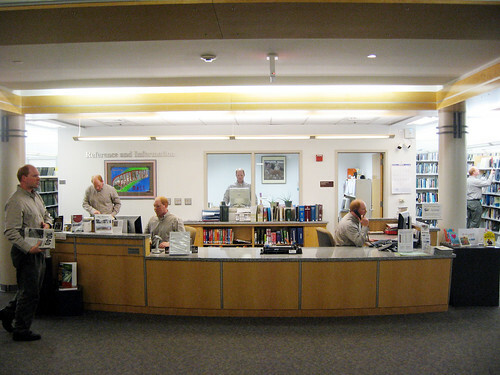 Since these acting Department Heads would be in charge of the building, we created some "Sunday Department Head Guidelines" for them to refer to if something unusual happened - and also to make sure the library delivered the same level of service on Sundays as we do the rest of the week. The goal was to have all necessary information - procedure, contact information, passwords, etc. - in one place. I know the staff here appreciated it, as it can be daunting to be in charge when something goes wrong. *Some people say I have a love of rules, but that's not true - orderliness and answers are what I like. Take that, entropy.